Music’s power to transcend barriers is helping two organizations in the Community Building achieve their dreams. Children’s Center Director Anita Morgan and Refugees Connections director Marijke Fakasiieiki are collaborating on a unique project that features music as a means to bridge the generation gap, as well as transcend language and cultural barriers. “Music as a First Language” will bring together little kids and elderly refugees to make music together. The budding partnership was inspired by a session of traditional indigenous music, and a little office eavesdropping. At Marjjke’s invitation, students of the Salish School of Spokane demonstrated Native American drumming and flute playing in the lobby of the Community Building last fall. They were joined by local retirees who enjoy music-making together, and elder refugees from countries such as Myanmar, Thailand and the Middle East. Anita’s Children’s center opens into the Lobby, so the joyous sound of young people and elders making music was flowing through the walls. Anita pricked up her ears. Later, when Marijke was looking for more office space in the Community Building Annex for her Refugee Connections programming, Anita was quick to offer an underutilized space of her own nearby. Consequently, the sounds of the English as a Second Language classes were within Anita’s earshot. I heard laughter, conversation and warmth expressed. I heard the sound of people glad to see each other each week. It warmed my heart to observe and hear the refugee elders as their small community developed and evolved. Anita was inspired by what she was hearing, and decided to do more than just share her space. She wanted to part of it. 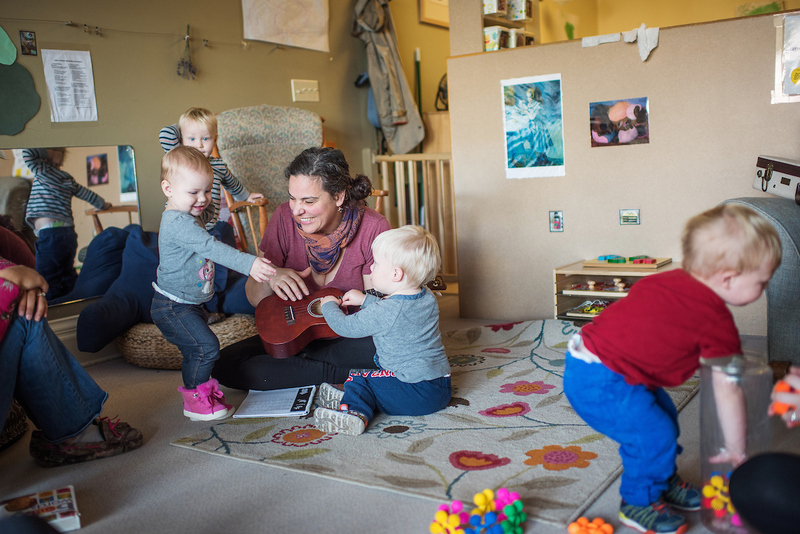 How about if the preschoolers and the elder refugees made music together? She approached Marijke, and both were excited about the possibility of mutual benefits. But Refugee Connections is a one-woman show, so launching their brain child would be challenging. Again, Anita had an idea and a resource. She offered one of her teachers, a music “ambassador”, to help bring their dream into reality. The first session is still in the planning stages, but the goal is start bimonthly classes later this month. Marijke is hoping the Music as a First Language project will help strengthen the refugee elder’s connection and sense of inclusion in this country and community. Anita is hoping her preschoolers will benefit from their contact with elders, an experience increasingly rare in today’s culture. She also hopes the diversity and richness of culture and language expressed by the elders will broaden the world of the Spokane youngsters. Above all, both women hope the shared experience of music will bring joy to everyone.